If you believe Hoo Crew has positively affected your experience as a supporter of Virginia Athletics, we hope you will consider making a gift to the Hoo Crew Endowment Fund. When Hoo Crew was originally founded in 2005 as an organization independent of the University and the Athletic Department, students paid for membership. Now, membership is free and all students are considered members of Hoo Crew—as they should be. While the Athletic Department funds several thousand Hoo Crew shirts each year, it operates on a budget that is becoming increasingly strained. The Hoo Crew Endowment was born from a commitment to find a new source of revenue for the organization as it continues to expand. Hoo Crew will be able to pull a greater amount of resources from it, continuing to grow its support for UVA’s student-athletes. You can donate here, and if you are a graduating member of the Class of 2019 you can donate through Class Giving (type amount into “Other,” and enter “Hoo Crew Endowment” in the “Personally Selected Gifts Box”). We hope you will seriously consider giving to the Hoo Crew Endowment. Anything helps, even if it’s just a couple of dollars. If you have any questions or concerns, please don’t hesitate to contact us. $20 Gift: Your name will appear under a list of donors on Hoo Crew’s website. $100 Gift: You have the option of receiving an orange Hoo Crew “Proud Supporter” short-sleeve t-shirt and sticker. You will be contacted after donating for sizing and delivery information. 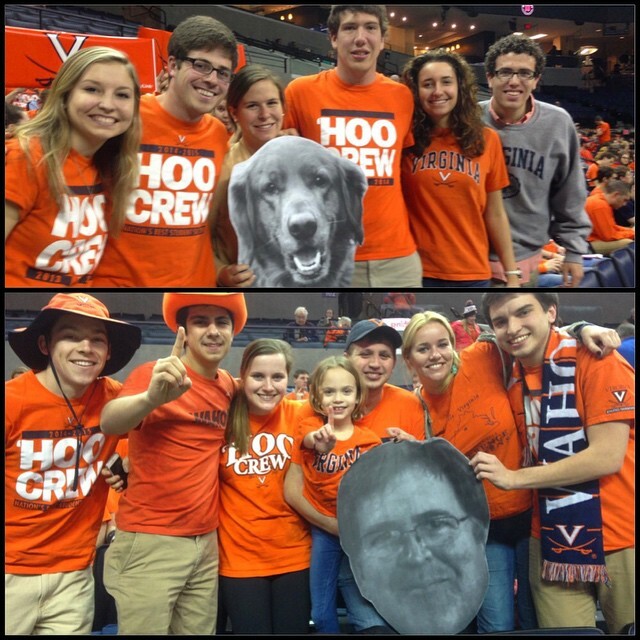 $250 Gift: Hoo Crew will make a sign or big head of your choosing to be displayed at John Paul Jones Arena. You will be contacted after donating regarding additional information. All donors over $20 will be listed on Hoo Crew’s website unless they would prefer otherwise. For a $250 donation, donors are eligible to receive one sign/big head and one t-shirt, OR two t-shirts. You may specify your benefit preferences when contacted by Hoo Crew following the receipt of your donation. Hoo Crew is a Contracted Independent Organization (CIO), existing and operating independently of the University. Hoo Crew is not an arm of the University’s Athletic Department or the Virginia Athletics Foundation (VAF). A gift to the Hoo Crew Endowment directly benefits the official student fan organization of the University and is not a donation to the VAF Endowment, which funds student-athlete scholarships, capital projects, and a portion of the Athletic Department’s operations. The Hoo Crew Endowment is a part of the UVa Fund located in Alumni Hall, and all gifts to the endowment are tax deductible.